Normal Monsters (Japanese: 通（つう）常（じょう）モンスター Tsūjō Monsutā), colored yellow, are Main Deck monsters with no monster effects. In the card description box (which contains the effect on Effect Monsters), Normal Monsters include a brief description of its lore. Starting from Starter Deck: Link Strike onwards, all Normal Monsters also include the designation "/Normal" on their Type/Ability lines. Only Monster Cards with "yellow" backgrounds are Normal Monsters. 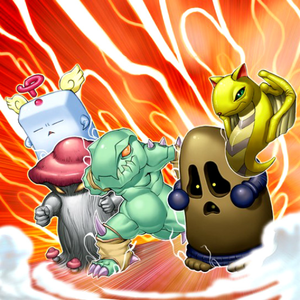 There are Tuner and Pendulum Normal Monsters, such as "Tune Warrior" and "Flash Knight". Non-Effect Fusion, Ritual, Synchro, Xyz and Link Monsters are not Normal Monsters. 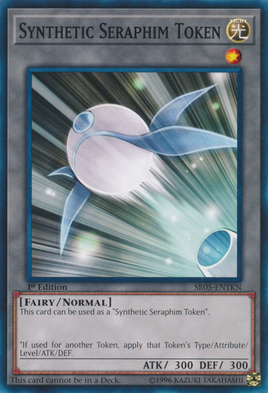 Some non-Normal Monsters can be treated as Normal Monsters with card effects, most notably Gemini monsters and some Trap Monsters. The card text (or flavor text) on Normal Monsters is for illustrative purposes only, and has no effect on gameplay (except archetype conditions, such as on "Summoned Skull" and "Gazelle the King of Mythical Beasts" in the English TCG). These texts provide lore on how the monster related to other cards in the game, such as the flavor text of "Opticlops" which explicitly states that it serves "Dark Ruler Ha Des". Though they do not have inherent effects, there are often Spell, Trap, or Monster effects associated with specific Normal Monsters. 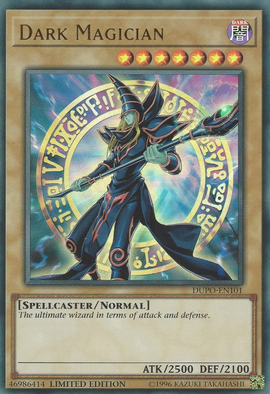 For example, "Dark Magic Attack" can only be used with "Dark Magician", "Huge Revolution" can only be activated with 3 specific Normal Monsters on the field, and "X-Head Cannon", "V-Tiger Jet" and "Dark Blade" are the specific targets for three specific Union monsters. Normal Monsters have received some very powerful support cards for general use, such as "Birthright", "Summoner's Art", "Knight of the Red Lotus", "Princess Cologne", "Terratiger" and "Ventdra, the Empowered Warrior", "White Tiger" and "Blue Dragon Summoner", "Dark Factory of Mass Production", and "Creepy Coney". The Normal Pendulum Monsters "Dragon Horn Hunter" and "Lancephorhynchus" support Normal Monsters. "Thunder End Dragon" has a powerful effect, but requires 2 Normal Monsters in order to be Xyz Summoned. "Rescue Rabbit" can Special Summon 2 Level 4 or lower Normal Monsters from the Deck, providing quick access to Xyz Monsters; this effect is so useful that Dino Rabbit Decks are built entirely around it. Some Normal Monster support focuses on low-Level Normal Monsters (typically Level 3 or lower). 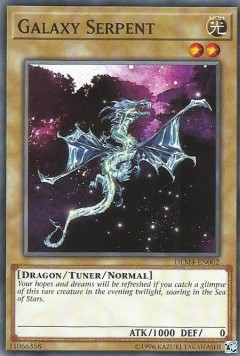 There are cards that allow the Special Summon of large numbers of low-Level Normal Monsters from the Deck (such as "Human-Wave Tactics" and "Enchanting Fitting Room"), to then be powered up with cards like "Triangle Power", "Amulet of Ambition", and "Sword of the Soul-Eater", or used to get rid of the opponent's cards with "The Law of the Normal". Normal Monsters were the most common monsters when the Duel Monsters card game was introduced in the manga and released in the OCG and TCG, but as the game's strategies evolved, Effect Monsters became more common and fewer Normal Monsters were released or reprinted. For a time, very few Booster Packs contain Normal Monsters, and even those that do contain very few. 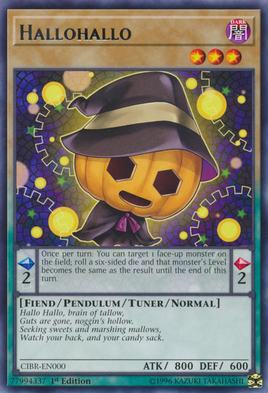 Following the introduction of Pendulum Monsters, however, Normal Monsters have seen a resurgence in Booster Packs, mainly in the form of Normal Pendulum Monsters, but more traditional Normal Monsters began to see a comeback during the New Master Rules for various strategies and in the Yu-Gi-Oh! VRAINS anime. In Yu-Gi-Oh! 5D's - Episode 121, Jack Atlas mentioned this while discussing the Decks of Team Taiyo, which largely contained Normal Monsters. The Normal Monster with the highest ATK is "Blue-Eyes White Dragon", at 3000. "Labyrinth Wall", "Neo Aqua Madoor" ,"Millennium Shield", "Dragon Core Hexer" and the Illegal card "Leonardo's Silver Skyship" have the highest DEF, at 3000. "Rabidragon" has the highest combined ATK and DEF, with 2950 ATK and 2900 DEF. "Leonardo's Silver Skyship" is the first Match winner Normal Monster, due to being a Pendulum Monster. "Thousand-Eyes Idol" is the Normal Monster with the lowest stats, being Level 1 monster with 0 ATK and 0 DEF. "Noble Knight Artorigus" has the longest English flavor text of all Normal Monsters. "Mekk-Knight Avram" has the shortest English flavor text of all Normal Monsters. 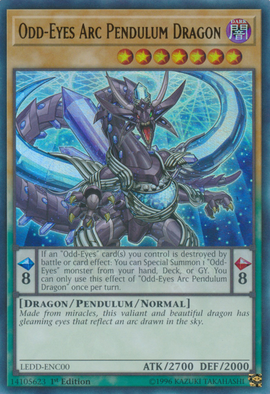 "Azure-Eyes Silver Dragon" is the only Synchro Monster that requires a Normal Monster(s) for its Synchro Material. "Thunder End Dragon" is the only Xyz Monster that requires Normal Monsters as its Xyz Materials. This page was last edited on 21 December 2018, at 12:08.